Experience a true luxury retreat at its best. Tavoos Garden offers intimate retreats for those who wish to enjoy daily yoga, meditation but also experience different wellness classes such as Nia dance, Bokator, and art therapy. Daily massages are included as well as a spa session, use of two swimming pools, with cultural and spiritual excursions off-site. There are three healthy meals and a detox juice included each day, which you get to choose from the wide range menu. Only a limited number of spots allowed in order to bring you the best care possible. Directly next door to Tavoos Garden & Wellness Center is one of the accommodation partners Green Leaf Boutique Hotel. A 10 room, non-profit, art inspired, the award-winning boutique hotel is where guests have the option to stay at while attending the retreats. All rooms open directly onto the swimming pool and garden. Rooms are spacious with one king size bed, bathroom, shower, television, fridge, AC, and many other amenities. Directly next door to Tavoos Garden & Wellness Center is one of the accommodation partners, Advaya residence is a luxurious hotel offering 17 rooms equipped with AC, fridge, private shower, and many other amenities. 13:00 Departure for 3-day retreat guests and continue for 4-day retreat guests. Prasad K is an instructor on this retreat. You will stay in an accommodation one kilometer away from the heart of Siem Reap (Old Market), situated in a tranquil area. Three meals per day and one detox juice will be provided. Once you book, Tavoos Garden & Wellness Center will send out a welcome kit where you can fill in your meal choices for each day. You will go to a high-end spa in the heart of Siem Reap for a 90-minute spa session. Tavoos Garden & Wellness Center are located 20 minutes from Siem Reap International Airport (REP) and they offer free pickup from the airport. If you are staying at your own choice of accommodations, they will pick you up and drop you off every day for free. Airport: Siem Reap International Airport Airport transfer included: Siem Reap International Airport No additional charges. You can request this in the next step. The deposit is fully refundable if the booking is cancelled up to 5 days before the arrival date. The rest of the payment should be paid on departure. 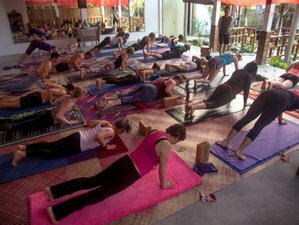 Tavoos is the only Yoga Alliance registered center in Cambodia. Offering 200hr YTTC as well as weekly wellness retreats including Nia, Bokator, Art and Yoga.